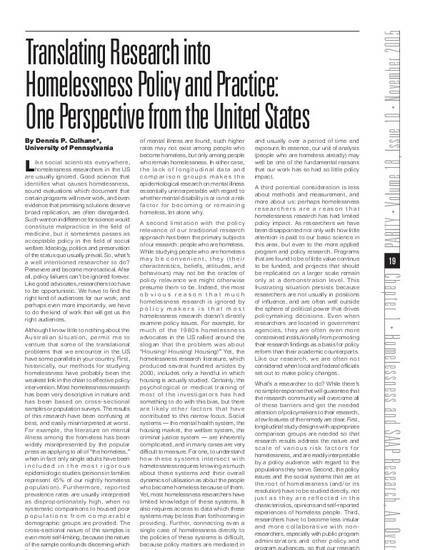 Like social scientists everywhere, homelessness researchers in the US are usually ignored. Good science that identifies what causes homelessness, sound evaluations which document that certain programs will never work, and even evidence that promising solutions deserve broad replication, are often disregarded. Such wanton indifference for science would constitute malpractice in the field of medicine, but it sometimes passes as acceptable policy in the field of social welfare. Ideology, politics and preservation of the status quo usually prevail. So, what’s a well intentioned researcher to do? Persevere and become more tactical. After all, policy failures can’t be ignored forever. Like good advocates, researchers too have to be opportunistic. We have to find the right kind of audiences for our work, and perhaps even more importantly, we have to do the kind of work that will get us the right audiences.